All transactions are safe and secure with a reliable history in online purchasing behind each of our associates. Buy the Masked Turtles shirt to own TMNT clothing and merchandise. Just as the theme song goes, Leonardo leads, Donatello does machines, Raphael is cool but crude and Michaelangelo is a party dude. 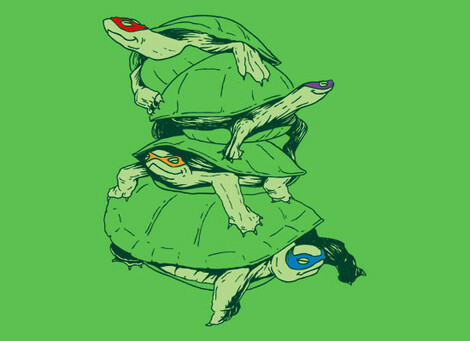 This Teenage Mutant Ninja Turtles t-shirt features the fun loving foursome minus the special effects. Don't worry, we hear Mikey and the gang still eat pizza, watch television and skateboard through the sewers. They just do it more slowly, including doing battle with villains. Speaking of foes, check out the Krang t-shirt and Shredder hoodie sweatshirt. In addition to the Masked Turtles tee above, browse the TMNT Clothing Gallery for more apparel like men's and women's clothes, kids shirts or hoodies.